The wonderful blogger Evin O’Keeffe is guest blogging on Jen’s Kitchen this week, here is her vibrant recipe for Chickpea and Olive Salad. Spring is around the corner. I can feel it. Or maybe I’m just hoping it is. Either way, one of my favourite ways to feel like it isn’t winter is to cook with fresh lemon and herbs. This salad is a quick, healthy, and nourishing meal that is a regular in my lunch rotation. It is meat-free so a nice option for Friday meals in Lent or an unconventional side salad for a larger meal. 1. 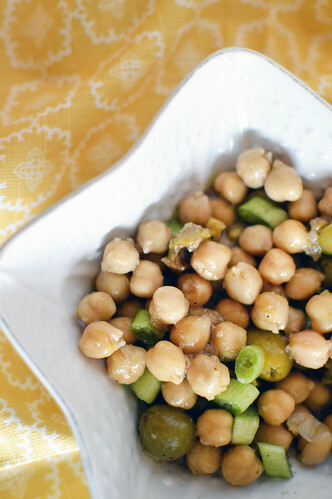 Add the chickpeas, parsley, olives, and scallions to a medium bowl and stir the ingredients together. 2. In a separate dish, whisk together the oil, lemon juice, vinegar, garlic, and black pepper. Pour it over the dressing over the chickpea mixture. Refrigerate the salad for at least 20 minutes or until it is time to dine. This salad can be made ahead of time and refrigerated in an air-tight container for up to 24 hours or served right away for a quick and healthy salad. 3. Serve the salad with spare sprigs of parsley as garnish. It goes well with grilled vegetables, such as eggplant, or alongside grilled breads and tapenade spreads. I give it another squirt of fresh lemon just before serving. 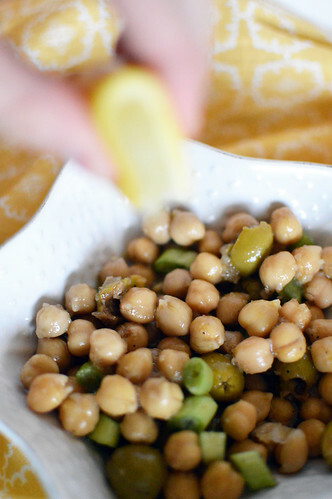 One Response to "Chickpea & Olive Salad with Lemon Dressing- Guest Blog"